Grace Rolfe, rotating her layout full twist on floor exercise. Madi Swayne executes a scale on balance beam. The Miami Trace gymnastic team recently hosted a quad meet with Sheridan, Deleware Hayes, and Buckeye Valley coming in for the competition. The Miami Trace team, (made up of all freshmen athletes), completed the meet in second place 119.5 points, behind Sheridan’s finish of 132.7. Hayes scored a 114.15 and Buckeye Valley posted a 57.75 team score. Devan Thomas earned her place in third on the balance beam out of 24 competitors. Teammate Abby Arledge stood in third (out of 24) for her vault. Arledge, 5th Bars (7.3) and 5th all-around (31.75). The two were only .05 of a point difference to complete the meet and lead their young team. The Miami Trace tumblers achieved their highest team score with their floor exercise routines. As a group effort, Miami Trace earned eight new individual improved marks. The team is back in action this Friday as they travel to Worthington to participate in the Warhawk Invitational. 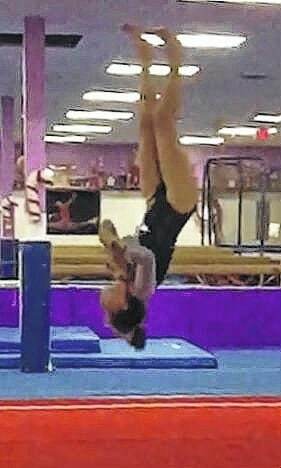 https://www.recordherald.com/wp-content/uploads/sites/27/2017/01/web1_Grace-Rolfe-.jpgGrace Rolfe, rotating her layout full twist on floor exercise. 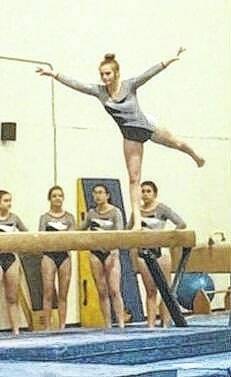 https://www.recordherald.com/wp-content/uploads/sites/27/2017/01/web1_Madi-Swayne-scale-on-balance-beam.jpgMadi Swayne executes a scale on balance beam.